I love ginger in major way. It’s funny but I have an actual memory of the first time I tasted it. My family and I were on vacation and spent a day at Epcot Center in Disney World and we had lunch in Japan Land (this was 1983, by the way). The entree we ordered came with a little dish of almost fuschia-colored pickled ginger. I can’t remember the entree we had, but I remember the ginger and ever since then, I’ve been known to eat all of the pickled ginger condiment that you get at the sushi bar. So, that being said, this drink is right up my alley. This is another gin based drink, similar to the Welcome Back, Cocktail that I posted last week. I think that gin drinks can be so fresh and summery. The herbal notes in the gin really compliment fresh herbs like basil, thyme and mint. This is a perfect cocktail to celebrate the beginning of the weekend! 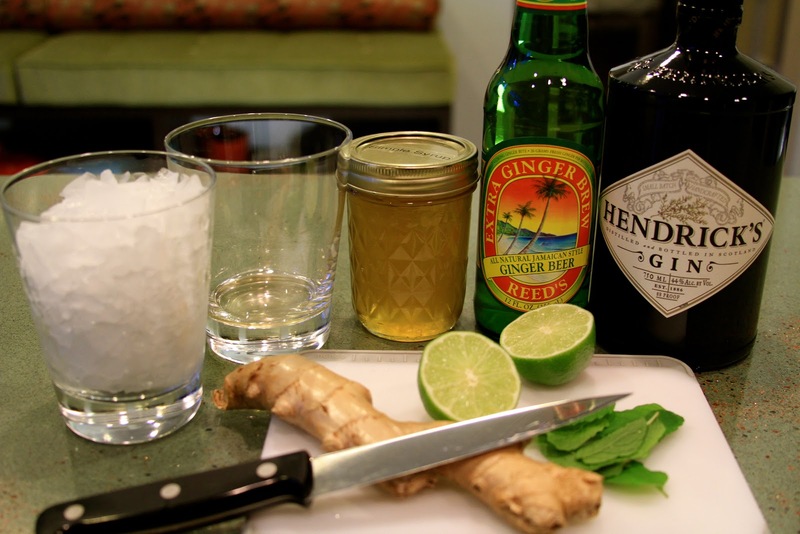 Pour the 1/2 oz ginger syrup into a glass with the mint leaves. Muddle the mint leaves in the ginger syrup until the mint leaves release their flavor. Pour ice into the glass, then the gin and the lime juice (I find that one half of a lime is almost exactly 1/2 oz). 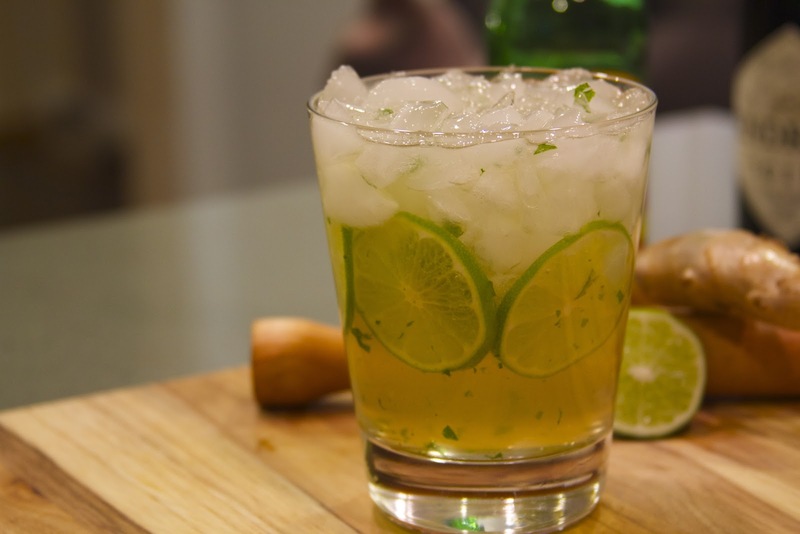 Top the drink with the ginger ale. Now, I like a more intense ginger flavor than regular ginger ale, so I like to use “Reed’s Extra Ginger Brew”. It really has a nice, strong ginger bite! Stir with a spoon from the bottom up and enjoy! Now, how easy was that? Happy Friday, everyone! *Ginger simple is very easy to make. Heat 1 1/2 cups of water in a saucepan. Cut a 2 inch piece of fresh ginger into thin slices and add it to the water along with about 12 black peppercorns. Dissolve one cup of white sugar into the water and simmer gently for about 30 minutes. Strain the syrup with a mesh strainer into a glass jar. You can store this in the refrigerator for about two weeks. Previous PostWhat a Difference a Week Makes!